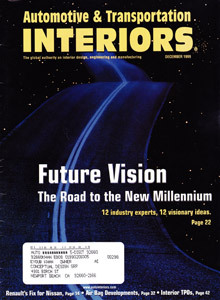 What can we expect in future automobile interiors? To avoid gridlock, we will need “intelligent” highways and vehicles that communicate with each other. This real-time exchange of data will prevent accidents, improve traffic flow, increase speeds and reduce pollution. Subsequently, automobile interiors will become much more user friendly. All systems will be automated and connected to neural networks, requiring drivers to input trip data and allowing vehicles to respond with the appropriate information on digital readouts. As a result, the dashboard will be a simple display, providing data only as needed. A comfortable, stress-free environment, developed from new technologies and advances in our understanding of human physiology, will “cocoon” the passengers. Telecommunication and information technologies will be essential. Telemetry from global positioning satellites will help us navigate and provide real-time data on the most efficient routes. Audiovisual devices will provide in-car entertainment and information along the way. Exotic aroma technologies will provide the desirable interior ambiance for any given trip. New “digital fabrics” will allow us to tailor our interiors to our moods on a daily basis, changing colors and textures at the push of a button. And advanced photoelectric materials will enhance constant-climate-control within the interiors regardless of the outside environment.